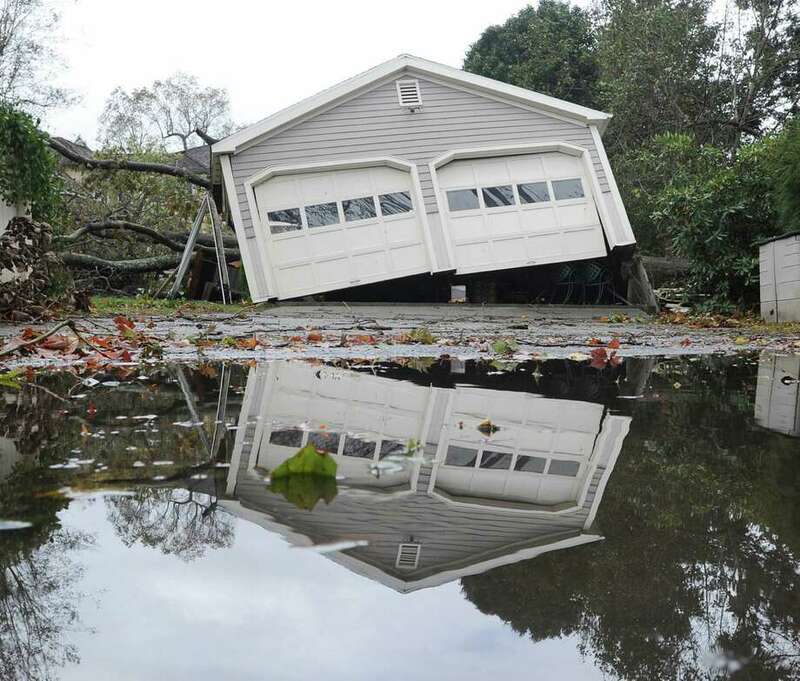 A garage off its foundation on Binney Lane during the aftermath of Hurricane Sandy in Old Greenwich, Tuesday, Oct. 30, 2012. Click through for more scenes from Superstorm Sandy's path through Connecticut. They always talk of the sound of a freight train, those who've experienced tornadoes and other high-wind disasters, the sudden deafening whoosh, like boxcars hurtling past, the trees yanked sideways in the gust. The train came here the night of Oct. 29 and, call it what you will -- Hurricane Sandy, Superstorm Sandy, Frankenstorm for those with a dark Halloween sensibility -- in the course of a few hours it changed lives and the landscape not only across our region, but also across a good part of the East Coast. The freight-train wind cocombined with a midnight high tide on Long Island Sound, a tide already swollen by the tug of a full moon, to accomplish a disastrous breach of the shoreline -- every one of its nooks, crannies, inlets, coves and harbors. Salt water spilled freely into any low-lying area -- home basements and utility substations, just to mention two -- destroying furnaces, electric power boxes and the precious belongings of a lifetime: photo albums, scrapbooks, Christmas decorations. The storm was an equal opportunity scourge, an indiscriminate leveler, darkening neighborhoods and spreading pain from the elegant enclave of Old Greenwich to the clogged blocks of Bridgeport's East End. It ripped trees up by the roots, snapped them at the trunk, stripped them of their limbs and hurled them onto power lines, houses and vehicles. For a lucky few, the lights flickered and the moment passed. For many more, though, the train's passing submerged them in darkness for days. Refrigerators, televisions, computers, furnaces, lights, all left useless. By 8 p.m. Tuesday, as the train was pulling out of town, the United Illuminating Co. reported 141,000 customers without power -- 41,000 of those in Bridgeport -- and CL&P reported 390,000 customers out, including more than 18,000 in Danbury. The savagery of the storm caused more than inconvenience. It killed 110 people in nine East Coast states, including four in Connecticut. As usual, here and everywhere else Sandy blew, first responders went into action, clearing roads, making it easier for utility companies to start what would be days long effort to restore power. One of those first responders was Russell F. Neary, 55, a volunteer Easton firefighter. He was killed during the storm as he helpd his crew clear a road and a tree fell on him. His death is a reminder to all of us how perilous can be the jobs of firefighters, police officers, EMTs, and any one else who chooses to run into situations that the rest of us flee. But just as the storm spread its misery around our towns, soaking and darkening our world, sapping spirit, so did it stir people to step up in ways big and small. Just when we think, especially at the tail end of months of rancorous political campaigning, that no one seems to have any tolerance for anyone, a better part of the human spirit took over in little corners all around. I took an unsolicited call on Wednesday, Oct. 31, from an 80-year-old woman in Fairfield who was so grateful for help she got from the a man in the town's Fire department that she just had to tell the newspaper. She knew only that the man's name was Al and that his last name was "Italian." When we tracked him down, we learned he was Al Menillo, an inspector in the Fire Marshal's office who was due to retire on Nov. 2, just days, as it would happen, after the barrage of Hurricane Sandy. You'll see here that Menillo, a 42-year veteran of the department, certainly didn't coast into retirement with his boots on a desk. By the end of the week we started asking for examples of what we called "Lights in the Storm." And they were certainly out there. What's contained in these pages is a sampling of the responses. We could not fit them all. Some are just short letters. Some are stories put together here after interviews with the people involved. It's something of a potpourri of expressions of gratitude to everyone from the much-maligned utility companies -- well, to their workers, at least -- to neighbors, strangers and officials. While none may approach the gold standard of New Jersey Republican Gov. Chris Christie leaping into the arms of President Barack Obama, they are no less genuine. They are stories of your friends and neighbors, and they only touch on the goodness that people muster when the chips are down. Michael J. Daly is the editorial page editor of the Connecticut Post.